Improve your players ability with this 1v1 skills drill. Players go against each other in the channel, and the defender must stay within the boxed area in the middle. - Set up for this 1v1 skills drill with 3 players and 1 ball per group. - Channels should be 10 yards wide and 25 yards long. - Central box approximately 10 yards in length. - Player A dribbles and must attempt to beat the defender and successfully get the ball to the other side. 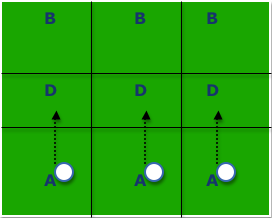 - If successful, player passes to player B and B then attacks. B will go twice in a row to keep drill repetitive and flowing. - After 60 seconds swap through the defenders. - Attackers should utilize a change of pace to beat the defender. - Attackers should attempt a variety of moves to beat the defender. - Scrimmage but add extra points for successful moves completed to beat a defender. - 7-10 minutes for this 1v1 with defender soccer drill.